I was tasked with photographing bags for a luxury Swiss brand. Originally a design firm, this manufacturer specializes in creating handmade, timeless and luxurious creations. They believe there is a market for an all-purpose, high-quality carry bag. The bags are of a rather exceptional craftsmanship, making use of the finest materials sourced from a variety of countries. The bags may appear simple, but upon closer inspection and touch, you are immediately reassured of the bags luxury. There were two deliverables to this project. The first task was to create clean and professional product images to be used for eCommerce purposes. These photographs were to be on a white background and nothing fancy or artistic. 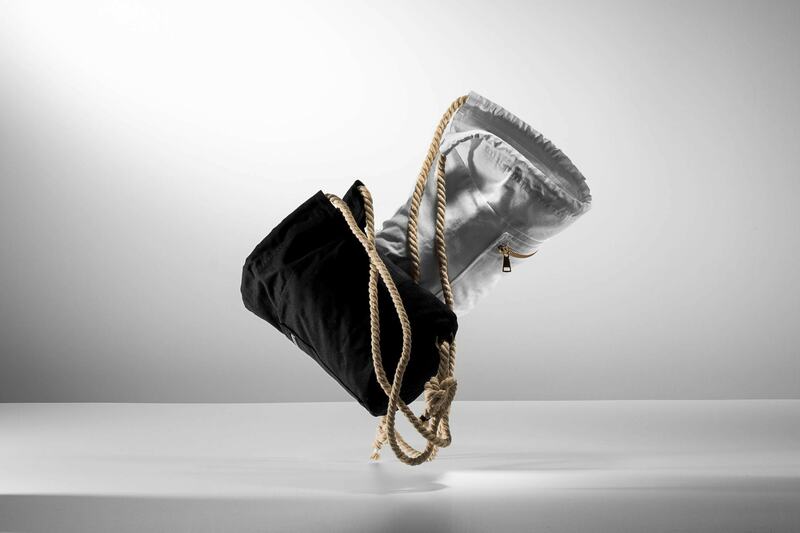 The carry bag line comes in two colors: black and white; with the black option available in small and large sizes. While the second deliverable was to rather demonstrate a creative ability and design and produce the hero shots. They gave me complete freedom over coming up with the final results. Their marketing team said to do something interesting photography bags, maybe spend time and play with them and give us something back. For this, I really spent a lot of time thinking about what I can do. I experimented with several different setups and lighting patterns. This is not something one can wake up in the morning and work straight through the day finishing. I spent even more than a week with these products. I let the brand and ideas incubate in my head for some time until finally, inspiration hit me. For some reason, this one shot, the final image, stuck with me and I believe it most accurately tells the story. The fishing line suspends the bags in the setup. Furthermore, wrapping paper and rods fill the carry bags so as to appear packed. I got them to the desired shapes and then let them finally clash together to create an interaction. The two colors of the bags are in contrast with each other. As they floated almost freely in the are they seamlessly dance under the lights. As a result, the shadows created were compelling. It’s one of those images that required very light post-production editing. Where the results of the still life happened naturally. Above all, am happy with the results and love how the subjects spoke for themselves with me not needing to over exaggerate or influence the scene much. What are your thoughts on the final images? Feel free to leave your comments below or on social media.